Daredevil has been injured attempt to clear his name. Detective Cole North has actually gotten the jump on Daredevil for the moment. Chip Zdarsky has put DD in a position to be on the run even harder then before. It’s not like DD hasn’t been on the run before. It’s nice Chip has put an outsider like North in the mix. He also gives us a little insight on Daredevil’s radar sense that I haven’t seen before. 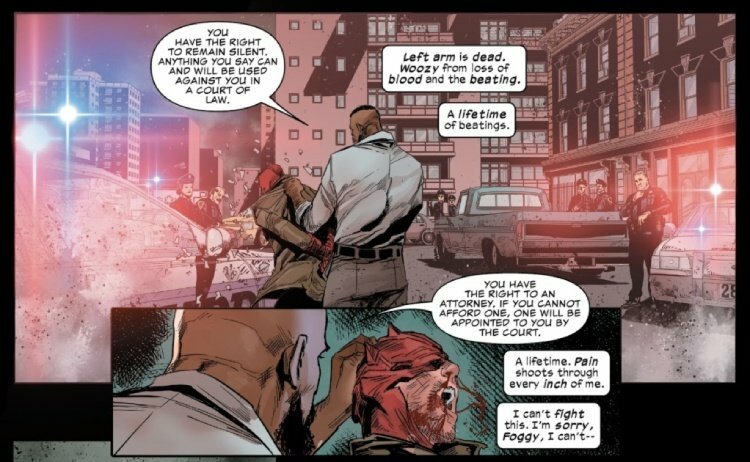 The book also adds the perspective of the police officers Daredevil has saved in the past. Marco’s art continues to fit the bill on the book. His art serves well in the gritty Hell’s Kitchen location and the street level fighting situations we expect from a Daredevil story. The end of the book shows us that Chip isn’t afraid to use another element of the Daredevil cast. The character is more of guest star, then a Daredevil chess piece. The next issue should shoot for the heights.